Scotland is a very diverse country and it is easy to forget how remote it can be when you’re in the central belt or the more populated areas. But when you’re trying to locate a big distillery, in the middle of nowhere, with no mobile reception for miles, you sometimes start to question your navigation skills. What? There’s supposed to be a distillery at the end of this 1.2-track, broken up, pot-holey road with no signs pointing you anywhere? 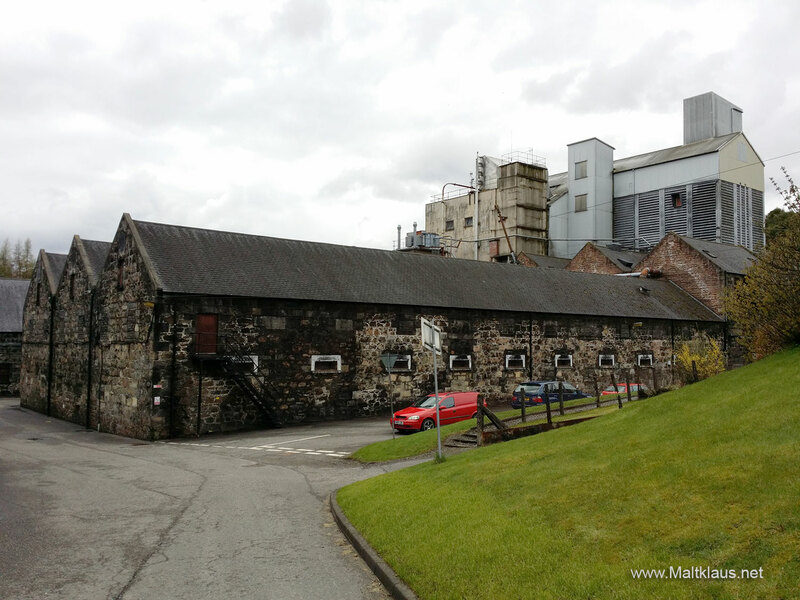 Yep, there sure is – and what a distillery! Pulling into the Dalmunach car park we (my brother Johannes and I) were met by malt mates Lora Hemy and Peter Moser, with Crystal Coverdale having traveled with us. 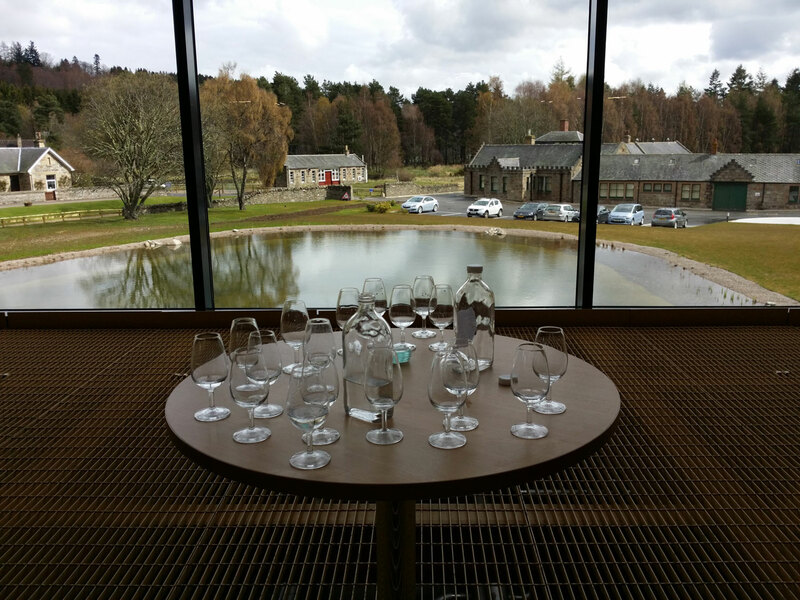 Speyside is a big area – but somehow you keep bumping into the same people! Distillery tours are always best with partners in crime! “Dalmunach? 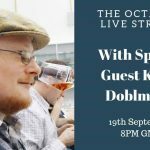 Never heard of it!” you might be inclined to say, unless you’re one of the most die-hard whisky geeks. 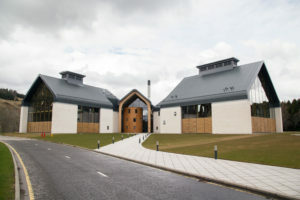 The new 10-million-litre distillery was constructed on the site of the previous Imperial distillery, which had been mothballed for several years and, since 2013, is now officially a “lost” distillery. Construction of the new site was in the hands of Douglas Cruickshank, a former Chivas executive, who started his career at the Imperial site at age 15. Talking about creating a legacy! 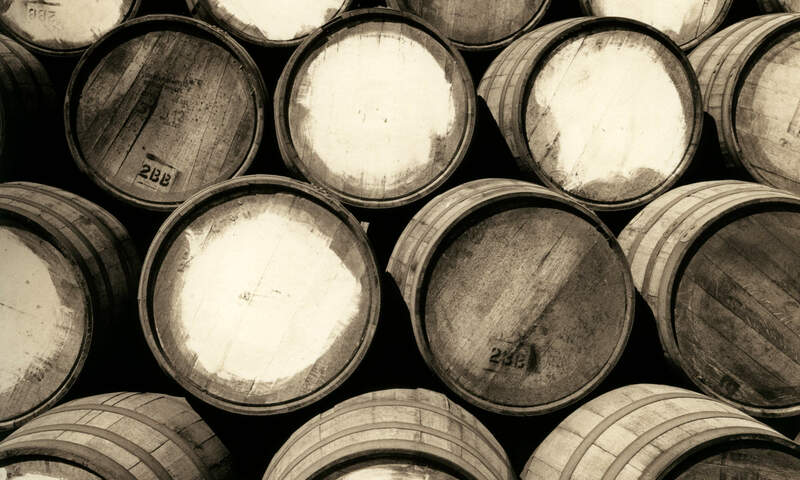 Dalmunach is owned by Chivas/Pernod Ricard and is to produce spirit for the blended whisky market, relieving stocks of the likes of Glenlivet and Longmorn. 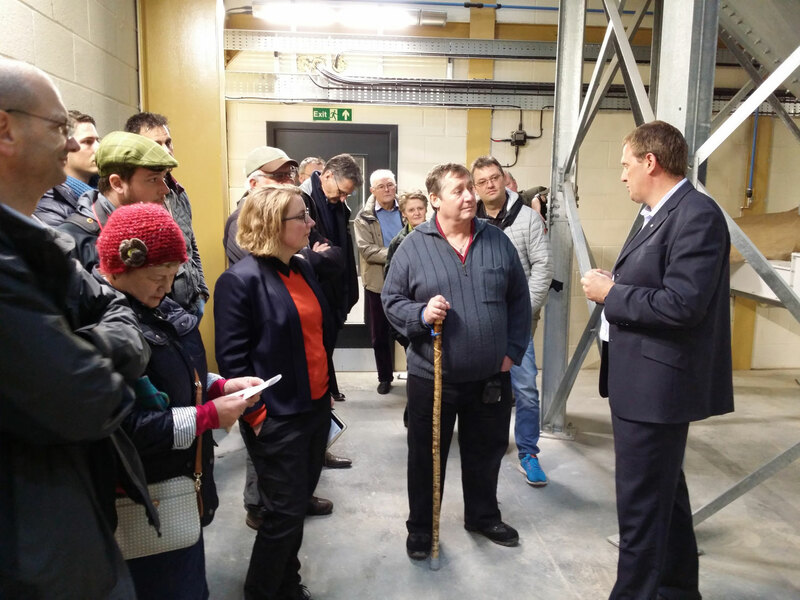 Production is overseen by Trevor Buckley, distillery manager and our “tour guide” that day. The distillery is not open to the general public, thus instead of entering a big, branded visitor’s centre, we met in the distillery “lobby”, which is dominated by a strange round, familiar shape. Wood from one of the old Imperial washbacks was integrated into the structure of the new distillery, housing for example the manager’s office, as Trevor pointed out to us. You can spot it in the first picture – the round structure in the middle. Joining us on our tour was also architect Mark, responsible for this stunning piece of functional, modern architecture, tucked away invisibly, like a hidden gem, by the river Spey. The plant has a layout of three strands, reflecting the three distinct production processes: Mashing, fermentation and distillation. And what a spacious layout it is! Lots of room, big, windows drawing ones eye to the stunning scenery all around. Not only the views are stunning, the technical aspects are also very impressive. 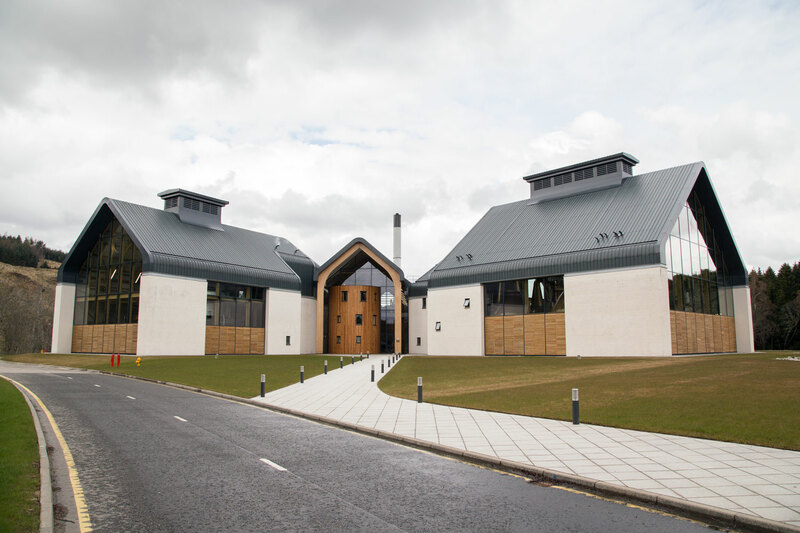 20% higher energy efficiency than the best of the other Speyside distilleries is the figure we were given. 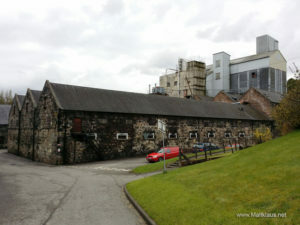 To achieve this, the latest and greatest technology was used everywhere, starting from the very silent, modern mill to the Briggs brewery mashtun with a capacity of 12 tonnes, which takes just 3,5-4 hours per mash and the 40% more efficient heating system of the stills – but we’re getting ahead of ourselves here. Once mashed in the massively big mashtun, fermentation of the clear wort (to support a more cereal spirit character) is carried out in no less than 16 stainless steel washbacks, housed in one of the three big strands. Fermentation times in the 60.000 litre vessels are relatively short – just 54 hours, increasing throughput and supporting a more cereal style of new make. Once fermented, the beer is pumped into the distillery’s cathedral, for want of a better word: the still room, with a huge glass window front. Four pairs of stills, the same shape as the old Imperial ones, but double the size, are arranged in a way so they form a circle around the altar-like spirit safe. 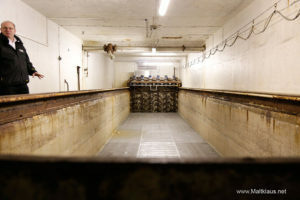 A spirit safe without the usual handles for making the cuts (this is done by machines below floor level), where the new make flows down like a waterfall, as can be seen in the video below. “oooooh”, “Wow”, “Impressive” were just a few of the words you could hear being uttered as we were led into the still room. Usually still houses are cramped and messy places, this one is spacious and clean, just like the rest of the distillery, and not nearly as hot as most still houses – we were in there for half an hour or so, just taking in the atmosphere, tasting the new make and asking Trevor loads of questions. One particular point of interest for many people was the heating system, which allows for 40% higher energy efficiency than usual. Speaking of the new make: It is a bit on the grassy – green, cereal side, but there’s also a surprisingly fruity aspect to it. I’m only just now noticing a slight discrepancy: in mashing and fermentation the cereal characteristics are preferred but in the end a fruity new make is what they’re looking for. Well, according to my taste, they’ve achieved both, for what it’s worth. New make is nothing without good wood, so I did ask Trevor about the current wood policy for Dalmunach: “First fill ex-bourbon for the time being” was his response, and I guess that makes perfect sense in a quest to achieve as flavourful a spirit as possible for a short time-to-market. All things considered everyone in our group was very impressed by this new distillery, tucked away at the end of a winding road, both by the architecture, the technical aspects and the spirit it produces. Hopefully Pernod Ricard does decide to bottle it on its own at some point in the future (no need for a 3-yo), here’s hoping it can continue an Imperial-ish style dram worthy of the site it was built on. 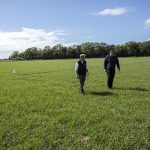 One last word about Imperial: There’s a green hill on the Dalmunach grounds – that’s the former distillery’s rubble, as Trevor was keen to point out. A graveyard of sorts. The former manager’s office and warehouses are still on site, as can be seen in one of the pictures above. They are wind- and watertight, albeit disused at the moment. No Dalmunach spirit is being matured on site, it’s all tankered away. Johannes and I were on our own again after the distillery tour and with a bit of time to kill, decided to drive down another road in search of another distillery, but ended up at Cardhu instead. Ah well, stuff happens. After a browse through the visitor’s centre we headed off towards our next destination: Tamdhu. Driving down to Tamdu distillery, fresh from a morning tour at Dalmunach, you’re in for a bit of a shock. It’s not exactly, let’s say, the most picturesque of the Scottish distilleries, also thanks to their disused maltings, the tall buildings in the picture on the right. Not having had lunch, starting the afternoon with high tea in the former Victorian Tamdhu railway station from 1899 (which, in contrast, was very pretty) was a very welcome sight. Another welcome sight was the arrival of Ansgar and Thomas Speller, who joined us for the afternoon. 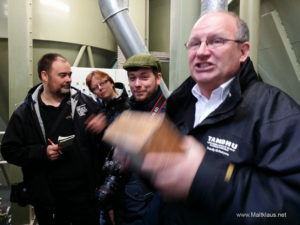 There was a lot of friendly banter, chatter and jokes exchanged between distillery manager Sandy McIntyre, Iain Whitecross (marketing manager) and the rest of the staff, while they introduced us to Tamdhu and their offerings (two bottlings and their new make) making for a very entertaining meal. Right now the only two bottlings available are a 10-year old at 40% ABV and a batch strength version (at 58,8% – because 8 is a lucky number in Asia, apparently). There will be new releases in 2017 and 2018 aged 12 and 15 years, when stocks will become ready (100% ex-sherry cask maturation). Tamdhu itself was mothballed by their previous owners in 2010, bought and restarted by Ian Macleod, who also own Glengoyne, in 2012/2013. 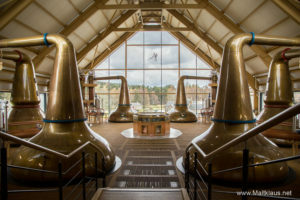 Investments in the distillery have been made and continue to be made, with a conversion to gas firing (together with Dalmunach, Cardhu and Knockando), a new liquid yeast system since last August as well as the mashtun being automated in 2015 and an upcoming investment in new malt storage bins as the current ones are still linked with the old and disused maltings on site (more about those later). 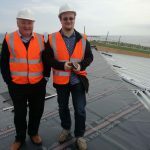 It’s good to see some money being put into the place with lots of plans for the future! 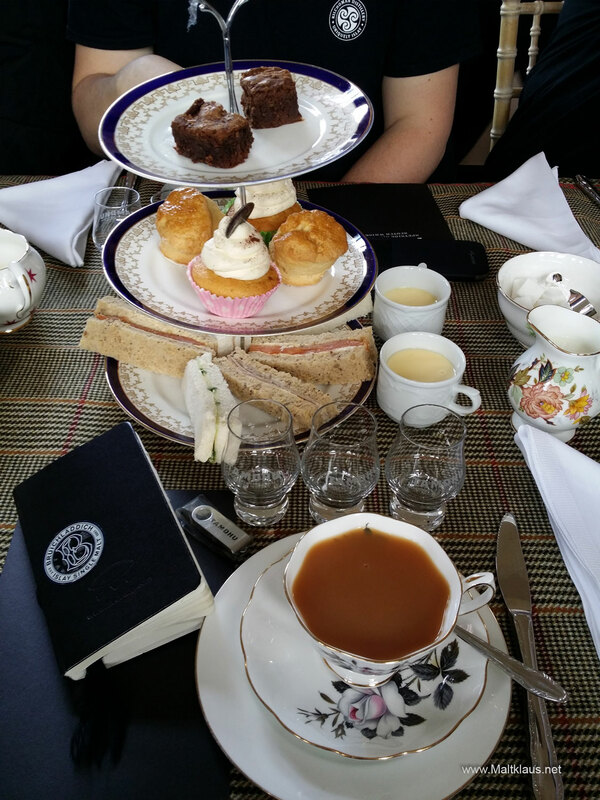 After we all enjoyed our tea it was time to leave the train station for a stroll around the distillery, to try and walk off the calories. 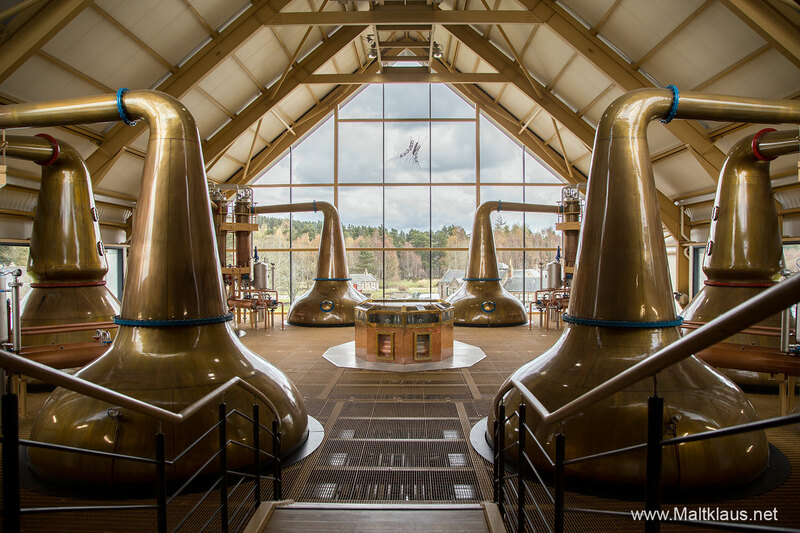 The distillery is a mixture of old and new, areas which look quite “original” and areas where modernisation has already begun. It definitely feels like a genuine working environment, not a polished visitor’s attraction, and that’s part of the appeal. The distillery is currently operating seven days a week, which is a good sign (quite a few distilleries have switched to 5-days of production recently). 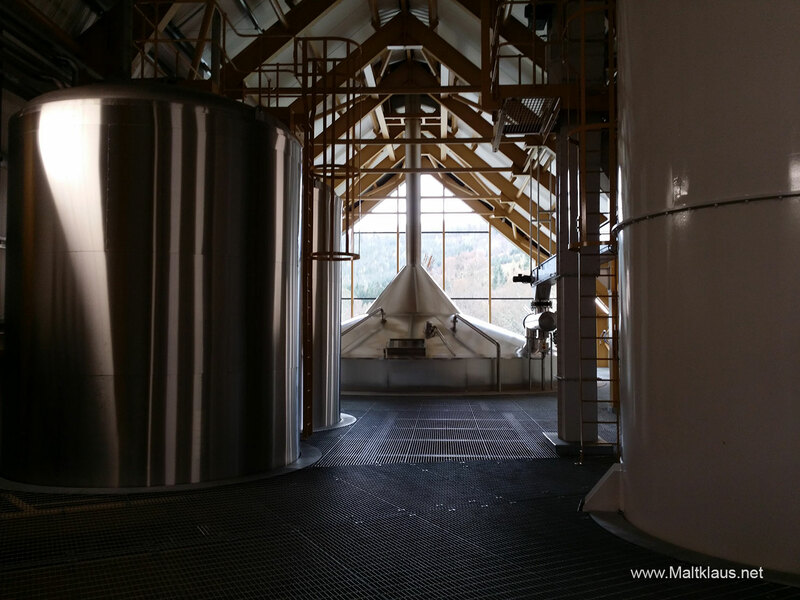 A mash consists of 11,85 tonnes of grist, resulting in 53000 litres of wort which ferment for 56 hours (like Dalmunach a somewhat short fermentation time) in one of the nine wooden washbacks. The tour ended as planned in the warehouse, with a prominent place for the seven oldest casks on site – 1961, 1968… These casks have been swapped in a very complicated deal with an independent bottler and will be bottled in the upcoming years. They are not going to be cheap, however – the 1961 cask is supposed to sell for about a million pounds, four to five figures per bottle. Sadly we did not get to try these casks, however we were presented with a few other cask samples. Comparing American oak vs. European oak (both ex-sherry) matured Tamdhu was enlightening, with most preferring the American oak (including myself). 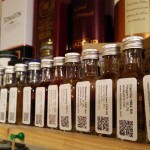 The third cask sample was sampled blind, with guesses all over the place. Already quite dark in colour and with a rich nose and taste, the only downside was an apparent harsh youth. “That sample was drawn from the first cask from the first mashing from the first distillation after reopening in 2013”, Sandy told the group – quite promising stuff a few years down the line. 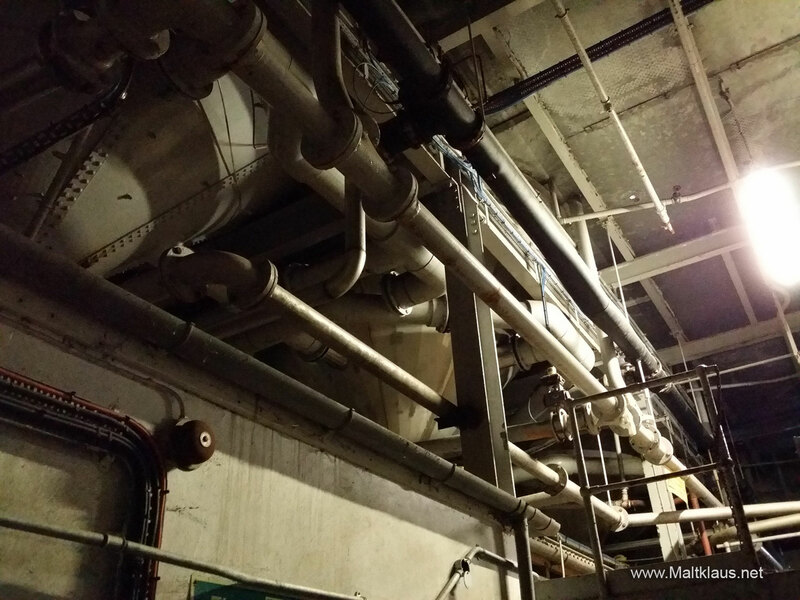 And thus ended the regular tour, but not for the Spellers and us: We got a tour to the mothballed maltings, which features some of the last remaining Saladin boxes in the industry in Scotland. Coincidentally Sandy’s background is in malting, so he could walk us through the entire process, even though he never worked the maltings at Tamdhu. Saladin boxes, used for germination, are a concrete box with a grid floor (for air flow), as can be seen in the picture. A crossbar with vertical screw travels across the bed to turn the growing barley, eliminating the need for turning the barley by hand. One of the advantages, as Sandy pointed out, was that each Saladin box, of which there are ten at Tamdhu, can be individually temperature-controlled. 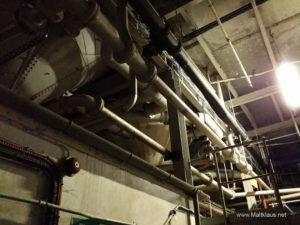 Sadly the malting production, the excess of which was used at other Edrington sites, such as The Macallan and Highland Park, was shut down together with the distillery in 2010, right after installing new steeps (11 tonnes each, two steeps per Saladin box) and initial automation tests. There are no plans of restarting the maltings, also for technical reasons. 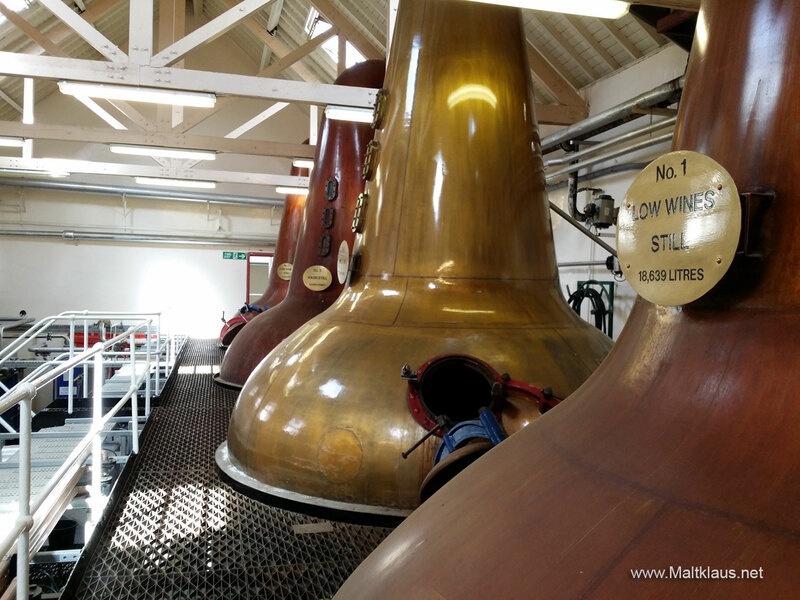 Parts of the plant (gas supply, effluent treatment) have been modernised but only in a size appropriate to support the distillery and they could no longer support the maltings anymore. So, sadly, it is “just a matter of if, rather than when” the maltings will be torn down. A shame, really, but walking through the buildings, after only just 6 years of neglect, even an untrained eye could see the amount of work (and money) needed to restart the operation, it’s just not feasible. Still great to have seen the maltings – big thanks to Sandy for showing us around! The Tamdhu tour did take us quite a bit longer than we planned to, so it was time to head off to Craigellachie for our next event! Our next appointment, organised by Peter Moser, took us to the Craigellachie hotel’s quaich bar for a Glasgow distillery presentation by Co-Founder Liam Hughes and Commercial Director (and industry veteran) David Brown. The latter saying about his hands-on involvement: “This is my retirement.” You could see the excitement in his eyes! 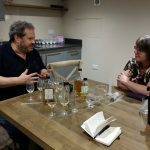 It was a small, relaxed, informal event with a handful of whisky writers, bloggers and industry friends joining to learn more about the distillery and the people behind it. Production started only in March 2015 and they’re hoping to fill about 600 casks this year and get phase two of their distillery build going. Liam and David brought their new make and an 8-month-old American virgin oak matured cask sampl for us to trye. I didn’t take proper notes as we got samples to take away (proper reviews on the site soon) but remember them quite favourably, with a clean new-make and a very toffee-rich spirit from the fresh cask. Every new distillery needs to raise money, so they’ve released their “Prometheus” range of whiskies, so far a batch each of a 26- and 27-year-old bottling of an undisclosed Speyside distillery. Both are sold out now, but there are future bottlings up to 30 years in the making and I’ve got a sample of the 27-year-old, which I will review separately as well. Thanks again, Peter, for making this happen, and thanks to Liam and David for taking the time! After visiting and tasting and walking and talking it was finally time for a proper dinner, just downstairs from the Quaich bar, in the copper dog, on invitation from and organised by festival Chairman James Campbell and Administrator Pery Zakeri. 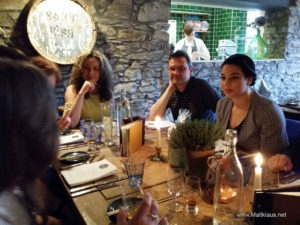 The fantastic three-course menu was just what we all needed after the long day and the #whiskyfabric members took lots of time for conversations – not only about whisky! 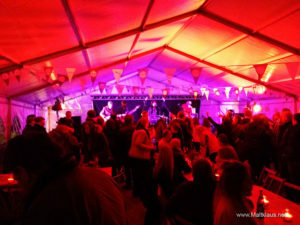 But that was not the end of the evening – it was the eve of the traditional DogFest, with the “Copper Dogs” playing outside the Craigellachie hotel in a tent. Well, let’s just say, it’s not an everyday occurrence you’re bobbing your head along to tunes while the likes of Nick Morgan are rocking the stage. Only in Speyside! //edit: The post previously stated Tamdhu featured the last remaining Saladin boxes in Scotland. This is not true. Baird’s still operate a row of them and Benrinnes has a further set of mothballed ones. Thanks to Ernie for pointing this out to me!